June 6th was Owen and I’s 20th Wedding Anniversary. Quite a shock as I don’t feel old enough to be married that long! What a ride it has been – lots of adventures, memories, travel, laughs, ups (many), downs (just a few) and all of it shared with a wonderful man. We have 2 fabulous children that are the light of my life and the continuing best accomplishment of our marriage and my life. Friday night was our official celebration. It was also our first out without the kids since we arrived in China. We have found a great babysitter so the kids were left in safe hands. 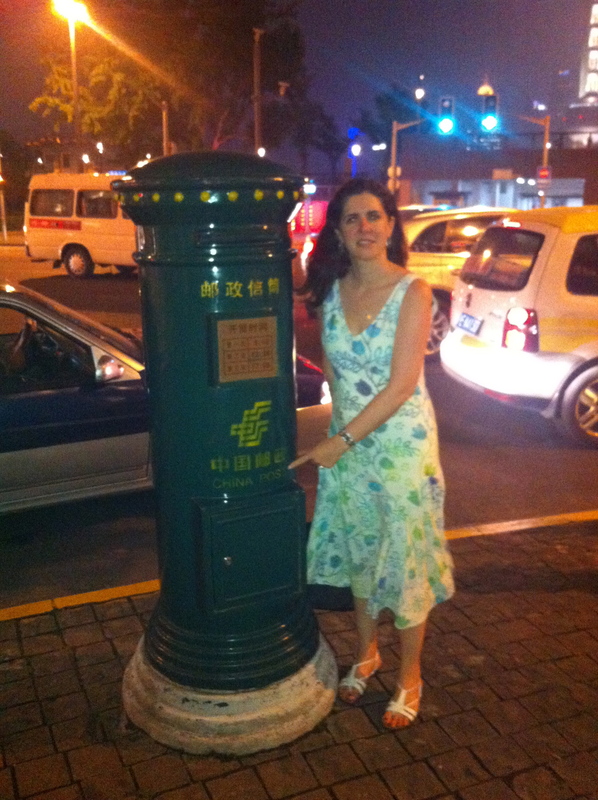 We went to Mr & Mrs Bund in downtown Shanghai. The restaurant overlooks the fantastic skyline which is brilliantly lit up at night. It reminded us both of 2 Urban Licks in Atlanta, very open, open kitchen and similar vibe. They make a big deal out of you making the most of their menu, your way, so that is exactly what we did. Owen started the evening off with a cocktail – an unusual margarita which was delicious. We shared seared scallops with ginger and lime, and a huge tiger shrimp served in a glass jar with citrus. The scallops were quite exquisite – a perfect combination of flavours. The shrimp’s presentation was very original and the infusion of the citrus peel and juices made this dish. Following this, Owen and I shared a huge Wagyu Ribeye Steak which was FANTASTIC. I have never eaten steak that literally melts in your mouth. We chose dauphanoise potatoes that were so finely sliced and mixed with brie and proscuitto – wonderful. Steamed garlic spinach and a herb salad completed this course. 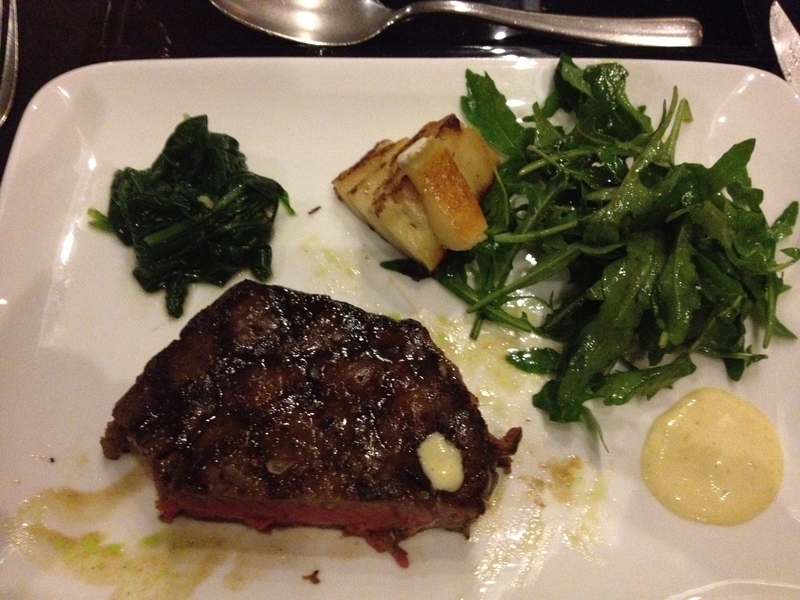 Wagyu Ribeye Steak – fantastic! The menu was so impressive, we were spoilt for choice. I felt full after finishing the steak, but was determined to have dessert! Owen choose Tart Tatin and I had their signature Lemon and Lemon. This is a time consuming dish to prepare as the lemon is cooked whole in sugar for 3 days. 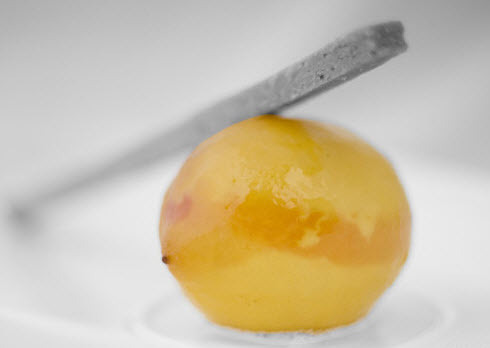 It is then scooped out and filled with lemon sorbet, lemon curd and vanilla chantilly cream. 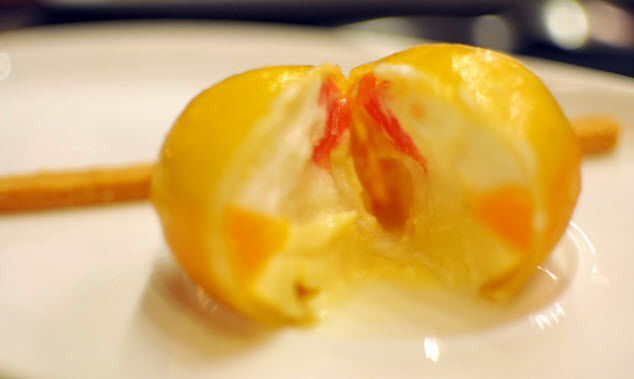 I was not sure about my choice when I was presented with a whole lemon on the plate, but once I had cut into the lemon and taken my first bite, I had to resist the urge to stuff the whole thing in my mouth!! To say it was a 5 Star meal is under-rating our experience. It was all super yummy! The service was great and it was an all round wonderful night out. 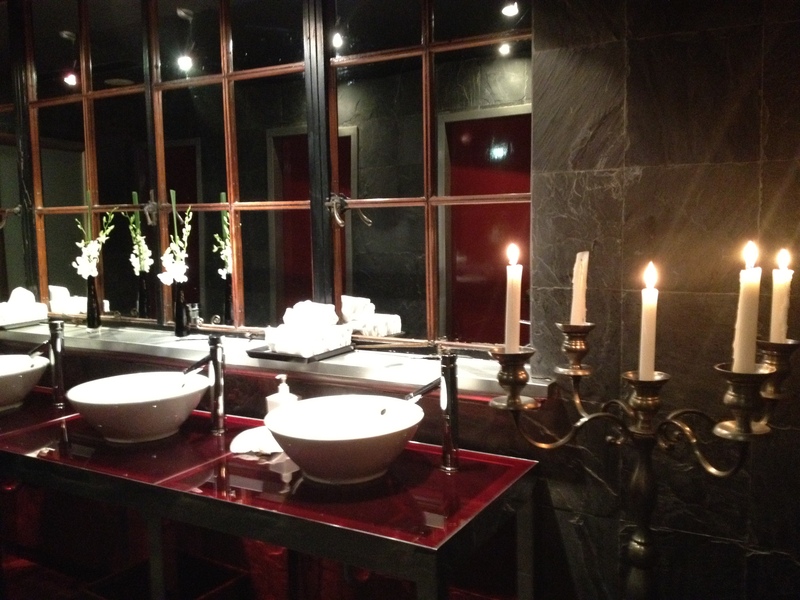 Even the toilets had candelabra in them! 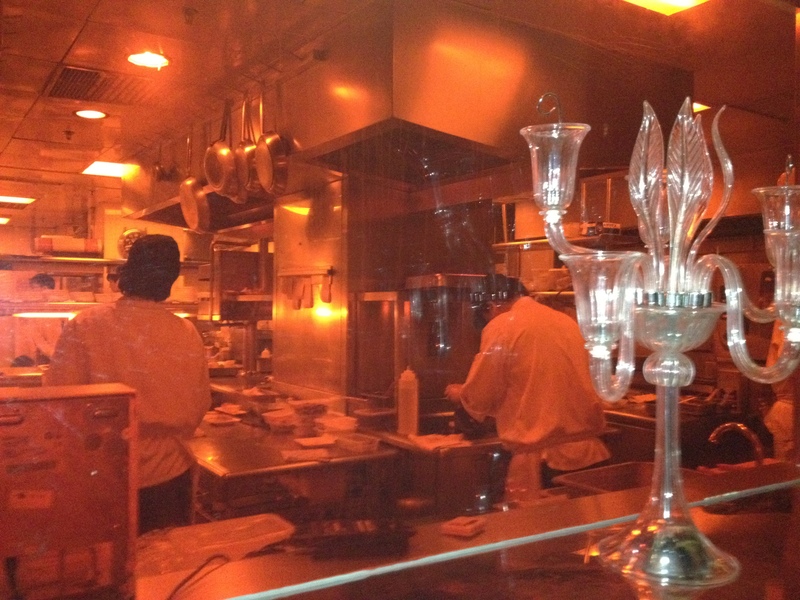 I loved the fact that kitchen was open and you could see all the chefs busily preparing the delicious food. Fancy Toilets! Love the Candelabra! Mr & Mrs Bund’s open kitchen and very busy….. 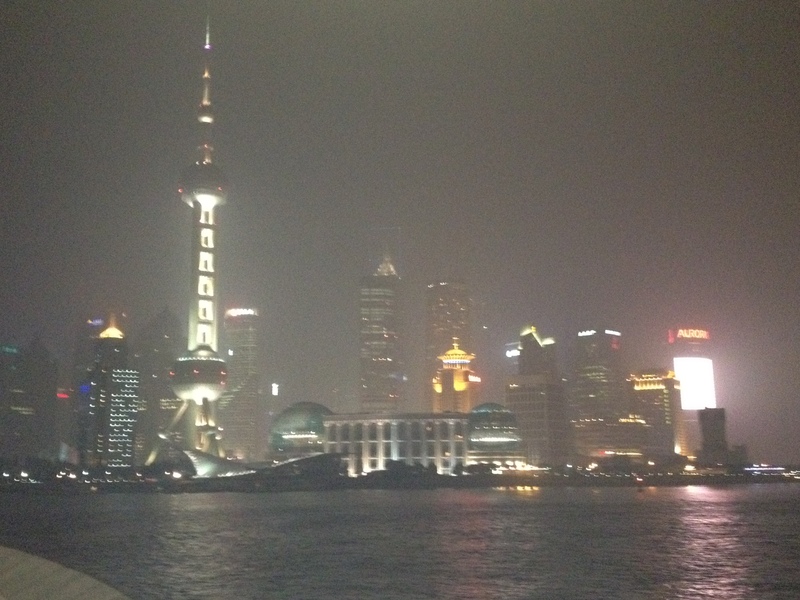 The Bund is the corner turn of the Huangpu River in Shanghai. One side is the modern skyscraper buildings and the heart of the Financial district. The other side (where we ate) is the older European influenced district with many original buildings in an old British colonial style. There is even a mini replica of Big Ben! The skyline is obscured in this photo due to the smog! 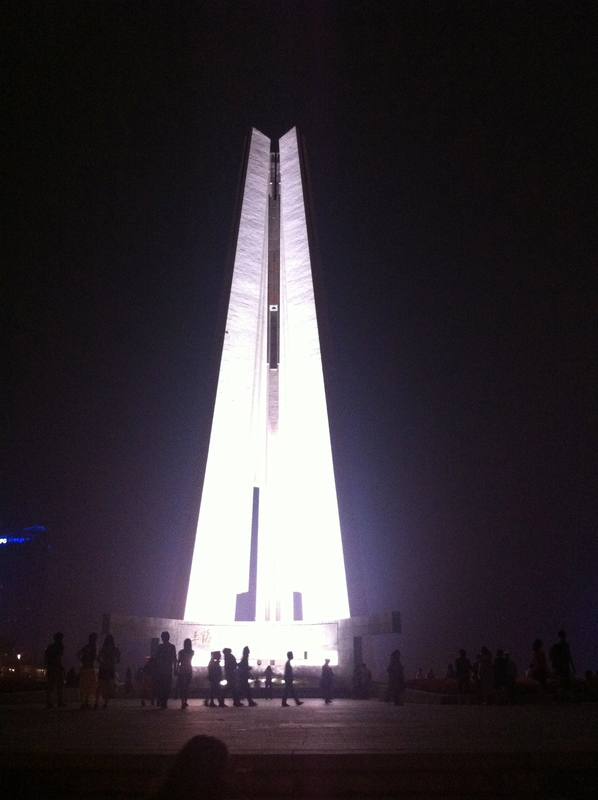 You cannot see the tallest building – the Bottle Opener, because of the pollution. It has been especially humid in the last few days, so I do not think we will be seeing clear skies for a while.